Fruit and chocolate are a natural fit! Each basket is a unique, one-of-a-kind creation prepared by an experienced local florist. No two are alike. Photo shown online is a representation of the final product. Specific fruit pieces, brand of chocolate, basket size, style, and ribbon will change according to florist preference and artistic direction. Fruits pieces may include apples, grapes, oranges, pears, or other fruits as available. Chocolates will be chosen individually for each basket. Arrives in a stylish wicker basket, ready to be displayed. During checkout, please be sure to indicate your preferred occasion when you choose a gift card. The Chocolate & Fruit Orchard is a hand delivered gift. These gifts are delivered by one of our local design centers located throughout the United States and Canada. Same day delivery is available for most gifts when ordered before the cutoff time. The cutoff time for The Chocolate & Fruit Orchard is 1 PM in the recipient's time zone. This was a sympathy gift and the family was very pleased. Boyfriend was so surprised and LOVED the items! His included grapes, apples, peaches, and pears. Chocolate included Reese's, Hershey's, etc. I paid extra for same-day delivery and he received the gift within 4-5 hours. I also added a white rose. He called me and couldn't stop talking about how much he appreciated and loved it! This is a thoughtful, sweet gift for anyone. Highly recommend! The basket of fruit and chocolate was beautiful and plentiful with fruit and a box of chocolates. I would give it Great if they offered free shipping but it did arrive in a timely manner. They even called the recipient to alert them a delivery was on its way. Basket arrived in a timely manner and was well received. Thank you. I purchased this gift basket for a close friend whose mother had just passed away. This basket really lifted his spirits and I am glad I found your website. This really helped a friend during a difficult time and he called and explained just that after receiving it. I ordered this for a funeral of a coworker's father, since I knew her large family would be gathering. Delivery time was exceptional and within hours of placing the order. She told me it was just beautiful, and so appreciated by the family. With all the heavy breads, casseroles and desserts they were given, the fresh fruit was a very welcome and a refreshing change. It was a wonderful, healthy option to nibble on. I ordered a similar basket just days before for a funeral out of state. Again, the delivery was within hours of placing the order. That family chose to make a fruit salad with all the beautiful fruits. They were grateful for a way to keep their hands busy while they worked together to feed the large crowd. Both who received were so pleased with the selections of fruits and quality. I will definitely order from this company again! Easy to order on-line for long distances, same day prompt delivery and impressive arrangements with balloons and champagne. The pricing is fare for a last moment order. Thank you, I guess I will be a loyal customer. This was a great fruit basket with a few very nice chocolates. The presentation was charming and very seasonally appropriate. Highly recommended. I could not see the presentation first hand since the basket was delivered to friends; however, from the positive feedback I received, the basket that was delivered must have at least looked as good as it does in the picture on your website. It was delivered in a timely fashion as well. A bit of joy delivered at a time of great sadness. Panic! No gift, she is distraught, no other cards or gifts either. Thanks for a computer and Gifttree.com. Not cheap, but truly functional. Quick, easy, options galore, just what a dysfunctional husband needs when time is short, and relationships are at stake. It was there, on time, and great quality. It's a "no brainier." Go for it! I was very pleased with the speed of which the gift was delivered. My recipient said that the fruit was very fresh. I did not get to see the final basket but would have liked to have had a picture of it emailed to me in advance. I did see the empty basket and was a little disappointed in the size. Hopefully it held a lot of goodies. This basket was beautiful! Lovely additions were added! Just the perfect touch! Thank you! We sent this to mom for her 90th Birthday today. When she got the basket she said it was gorgeous and full of fresh and wonderful fruit and chocolates. She loves fruit and eats it 2-3x a day so this was the best gift for her. We bought the "better" category and it couldn't be more perfect. Will be using this company again soon. Fruit Basket to Son-in-law... who was ill.
My daughter-in-law just loved the basket and the fruit. She hid the chocolates so that the kids wouldn't get into them. The fruit was well chosen and polished to a bright waxy finish. I will use you the next time I need to send something. I bought this for my Dad on Veteran's day, I don't live anywhere close to them so I needed it done same day. Both my Mom and Dad were VERY happy with the basket and gave rave reviews about it. They were also very impressed with the delivery person. All in all a GREAT experience. The basket was delivered promptly,and since it went to the house where the family had gathered--it was welcomed by all. In the midst of the hard work to prepare for the funeral, everyone who passed by the table, would partake of the goodies! I was sent a photo of the basket... gorgeous, and beautifully presented. Sent this to my cousin and his wife when her mom passed away. Received a phone call a couple days later saying how amazing it was. Will definitely do this again for any occasion! Very nicely done with a great assortment. I sent this to a co-worker and he was very pleased with it. I would order again. The recipients of our gift said it was lovely and delicious! This item was for a dear friend that I have known for many years who has lost their father. They personally called me to thank me for such a beautiful gift. This fruit basket was put together very nicely and all the fruit was very fresh. I highly recommend this gift. Arrived on time and my mother in law was very happy. My daughter and son-in law loved the basket of fruit ,they said it was sooo fresh and delicious. They told me I found a great place and to use you again, which I will! Thanks! Our friends were delighted with this gift! They said that the basket overflowed with lovely, tasty fruit and such a wonderful assortment of delicious items! The local distributor called before delivery, which was very helpful. Thank you for helping us send the perfect gift. This was sent by my company to a colleague as a sympathy gift. We received a note that it was a wonderful gift a little while after it was received. I ordered this as a gift for my boyfriend. There was a mix up at his office and didn't get it until the Monday after. I originally thought that they had delivered it late. Thankfully, their customer service team jumped right on it and fact checked everything. Thanks for finding the resolution! Great staff! My niece was very happy with the contents of the product. she said the candies were very good and the apples were excellent. Loved the pineapple. Thank you very much. I needed a Sympathy gift to send FAST. A couple in their late 70's had just lost their grown son suddenly. I searched for Flowers, and then Fruit baskets. I came across this Fruit and Chocolate basket and it was PERFECT! The gift arrived FAST, and the Family LOVED IT. PERFECT in EVERY WAY!! I even got to upgrade the basket at checkout. THANK YOU!! We sent this as a condolence gift to one of our employees and he emailed to tell me that this was a wonderful gift! Everything in it was so fresh, it came packaged very carefully and he and his family enjoyed it very much! Thanks for your on time delivery and great product. Thank you so much! A co-worker lost her husband and of course we wanted to do something special for her and you made that happen and the prices are unbelievably great! Thanks again!! I was disappointed that this basket could not be created and sent. It was hard to believe that no one in an area as large as Boston could not create this arrangement. while I personally did not see the gift basket the receiver greatly enjoyed the thoughtful gift. While this was my first purchase, I will certainly use this service in the future. Thanks. I sent this to my nieces and nephews when they unexpectedly lost their dad. Being that they are younger, I wanted to do something more for them rather than just sending flowers to the service. It was an appreciated gesture and it also helped my mother in law with snacks etc while so many family members were stopping in with condolences. The fruit was fresh and there was a nice variety. I sent this as a sympathy gift instead of flowers. I received a call saying how beautiful it was and how everyone enjoyed it. It was a thank you for hospitality. They loved it. I will order from you again. Fresh fruit, chocolate PLUS cookies! Office recipients were very happy, even sent me a photo of the basket. This worked well because I was able to add cookies to the standard fruit & chocolate, which meant there was plenty for everyone to choose from. I would order this again. This is a WONDERFUL basket! we (as a company) sent this as a Congratulations to a fellow employee and his wife, welcoming their first child as well as the "guess how much i love you" gift set. Both were so well recieved that the wife was actually bragging to her girlfriends about what great quality these gifts were! we are all so pleased we will for sure be ordering these gifts again in the future!!! cannot say enough about this basket and the "Guess how much I love you" gift set! Excellent assortment of fruit for a week in a hotel. The chocolates were heavenly! My aunt who turned 90, absolutely loved it. Fruit, good, fresh and plentifull. Will order from your company in the future only. Have had terrible experiences with other websites. I purchased this as a Father's Day gift for my dad 300 miles away. Although I was unable to see it, he was very pleased. He indicated that there were grapes, bananas, apples, cookies, chocolate and a card. The basket arrived at 6 pm, so I was elated to know that they delivered past 5 pm. I purchased this basket for my nephew as a get well gift. It was delivered within hours if ordering it. I didn't see it, but my nephew was overjoyed with its contents. He is 19 so it could be used for any age. He said it was fantastic! Anything I have ordered has been great. And Bam! Delivered right on time at the day I specified, great presentation (co-workers nearby took pictures and sent em to me) and the actual food items in the basket (i.e. fruits, sweets, etc.) got rave reviews. No issues, or stress... and the price ain't bad. I'll be using this service again -- why haven't I heard of this before! I sent this as a condolence gift. I heard that it was great, especially the chocolate that was included. Was a great gift with the added candy and cookies. She loved it! Recipient liked this a lot - this part of the order was delivered on time for Mother's Day, and was a big hit. Fruit basket was sent to a work associate from her team. Basket was appreciated, fruit was fresh and she gave it a high rating. It put a big smile on the faces of the people who received this basket. I will be using this company again!! I sent this basket to a friend to brighten her day. It arrived as promised and I was told it was big and beautiful. She really enjoyed it. 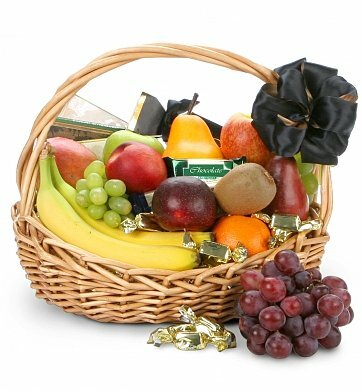 Sent this basket as a get well pick me up and the receipient said that the fruit was the best tasting fruit she had had in a long time. My clients really were impressed with this gift. It's classy and intentionally not overwhelming. I recommned this gift. well stocked with fruit and chocolate. Great gift basket! Nice to be able to do this last minute. It was sent as a get well gift and it was a choice between flowers and this fruit & chocolate basket. The basket was very well received and appreciated she didn't have to watch the flowers die (as she put it). The fruit was fresh and tasty and the chocolate was a nice touch - who doesn't like a bit of chocolate! The fruit and chocolate basket was delivered as promised and made my college student daughter very happy during midterm week. Lovely arrangement with delicious fruit and chocolate surrounding fresh pineapple. I live in New York and was sending to Arizona. I ordered in the morning and was delivered the same day withOUT any extra charges. The recipient said the gift was excellent and had a nice selection of fruits and chocolates. I would definitely order from this company again! I sent my father this basket after a surgery and he LOVED it. It arrived on time and looked better than i could have ever imagined. He could not wait to take pictures and show it off. This basket definitely surprised the boyfriend. The customer service was amazing.. The basket arrived on time, all fruits were delicious according to him. I have never encountered such an amazing customer experience online nor in-stores. They truly put effort in achieving customer's satisfaction. Even though my boyfriend is in the military, they managed to still deliver on time and to him personally. I will recommend anyone thinking about buying from this company. Delivered on time, beautifully done & my friend loved it!! The recipient loved, loved, loved this gift! A card was left on the door and when he collected from reception it was a nice surprise, seeing as i was not there in person to cheer him up. Thanks again will definitely buy again! My son called me and I was suprised that he had received it so quickly. He liked the Basket but when I asked him about the chocolates, he said only 1 bar of choc. was in the basket. I was hoping for a little assortment. It was beautiful and absolutely PERFECT!!! I not only made my girlfriend happy, but all her coworkers were able to enjoy the fruit and chocolate!!! They all asked where did u get that from, such a great gift!!! I told them Gift tree, check it out! Thank u so much and I look forward to using ur site again! I sent this basket to family who had just lost a loved one and it was plenty for all to share. It was a good size basket for the price and really appropriate for any occassion. It was also delivered the same day for no extra charge! I sent this basket to a dear friend very far away from me in sympathy on the death of her mother. It was delivered as promised and it was very acceptable. My family really enjoyed the combination of heathly options as well as chocolate in this beautifully made basket. My father received this basket as a Birthday Gift. He and his wife took the basket on a road trip and enjoyed all of the contents, right down to the fun-sized chocolate candies. He called once to let me know how beautiful everything looked, and then a second time to let me know how delicious everything was. Thank you for making it such a wonderful Birthday experience for him. I purchase this as a sympathy gift and the recipient came in the next day and said what a great gift and how it had such a different variety off fruits - like kiwis, nectarines, - not the same old - same old. I sent this basket to my supervisor during the loss of his wife. He said the basket was wonderful and that it had a large variety of fruit in it. He said his family really enjoyed it. i choose this product because offered fruit and chocolate, the presentation looks nice and the price was very good, i will just change the color of the bow for a green bow. I will continue buying more as the family who received the product was very happy. Fresh fruit for my mom in the hospital across the country. My 81 year-old traveling mother found herself alone in a hospital across the country, having to eat the canned fruit that she was given with every meal. Sending this fruit and chocolate basket for Mother's Day really served a purpose. The fruit was very fresh, but a little dirty (she had trouble adequately washing it from her hospital bed). She only got two 3 packs of chocolate.....I was expecting a little more for the money. Overall, however, delivery was very prompt and she was happy with the basket. Our business management team uses this site to send gift baskets as sympathy gifts for anyone on our team who has lost a loved one. So far, each basket has received great feedback and has arrived on time. Our team member said that this basket was beautiful and the items were great! We love the fact that delivery can be on the same day as the basket is ordered. It's such a convenient way to send gifts for a business! The persons receiving this gift were blown away and could not say enough good things about this gift basket. They said it was huge, had a great variety of fruits and the chocolates were yummy. I sent this to my Mom who was in Rehab after surgery. She loves fruit and they don't offer that much on the menu so I sent this to her so she could have her fruit in her room whenever she wanted. She loved it and was so happy and surprised. She said the fruit was very nice and she had so much she was sharing with her roommate and visitors. The price was very reasonable for the size and quality. I will definitely order this item again! My Mother enjoyed it, my only complaint is there was no chocolate. Mother had many pictures taking of the basket and wold not open it up until all of the family so it. Thank you. The basket contained as much, if not more, fruit than shown in picture. The fruit was delicious. The high quality chocolate added much to the basket. Delivery was right on time. Lovely basket, Fruit was GREAT! Great basket! Great quality fruit! Exceptional. The recipient, who lives over 500 miles from me, was pleased.